What words come to mind when we think of Mr. Leigh? Committed. FUN. Boisterous. Entertaining. LOVING. Mr. Leigh is committed. For 5 years he has served faithfully alongside our community. As a volunteer at Kids Club he shows up twice a week, and seldom if ever misses a day or field trip. As soon as the school year started Mr. Leigh made sure we gave him a schedule of all of the field trips so he could move his work schedule around, sometimes even taking time off, to join us as a chaperone. From field trips to the trampolines, pool, museums, Mr. Leigh helps keep our kids’ safe, and helps ensure they have FUN! He is boisterous and entertaining. If you ever heard Mr. Leigh reading, you would have a hard time not wanting to stick around more to listen. His impersonation of kings, dragons, and all kinds of books bring stories to life and bring our students into a whole new world as they read. 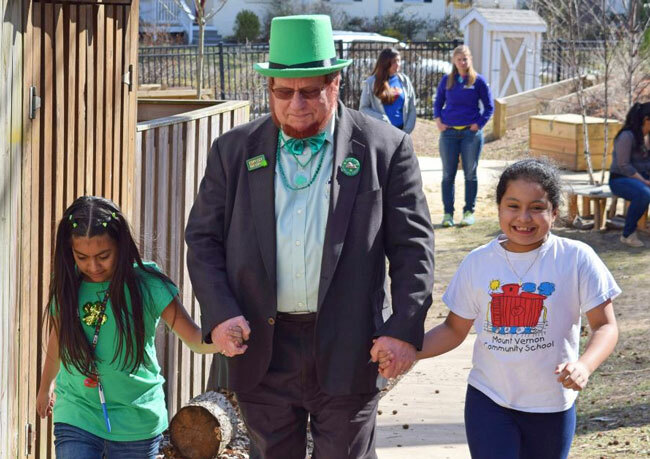 One of the kids’ favorite days is when Mr. Leigh shows up as a Leprechaun. It’s hard to keep the fanfare focused. But once all of the kids are given permission, they swarm the coolest Casa Chirilagua Leprachaun ever. Ever. Mr. Leigh is LOVING. Mr. Leigh shows up week, after week, month after month, year after year because he loves us. And he knows we love him. Mr. Leigh’s stern commitment to our kids is admirable. Like many of you, he’s always demonstrated care for our students in the best way he can and we love him for it! What have you learned through your experience working with students at Kids Club? What motivates you to continue volunteering week after week? What has been your most memorable experience volunteering with Kids Club?